This page sheds some light into the relationship between Maitreya and some well-known figures such as Sai Baba, the Buddha, Krishna and Krishnamurti. This information is excerpted from the books by Benjamin Creme. 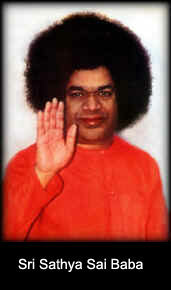 Sai Baba is a teacher or guru in south India with an enormous following. Hundreds of thousands, perhaps one or two million people from all over the world would claim to be his devotees. These Followers see him as God, the creator of the universe. He is a cosmic avatar. Sai Baba and Maitreya both embody the same energy--what we call the Christ principle, the energy of Love --- Sai Baba at the cosmic level, Maitreya at the planetary level. The relation of Sai Baba to the Christ: The Christ is a planetary avatar, Sai Baba is a cosmic avatar. He is a Spiritual Regent, sent into the world by the Lord of the World, Sanat Kumara, on Shamballa. A regent "stands in" for the king. Similarly, a Spiritual Regent "stands in" for God, for the Logos, Whose reflection Sanat Kumara is. Sai Baba embodies the energy of Love at a cosmic level (the Christ embodies this energy at the planetary level) and his work, in part, is to prepare humanity for the work of the Christ. By awakening the love principle in humanity, Sai Baba will prepare people for the Initiatory work of the Christ. As the Hierophant, the Initiator, at the first two planetary initiations, the Christ will lead humanity gradually out of the strictly human kingdom into the Hierarchy, the Kingdom of Souls, or the Kingdom of God. That is his major work in the coming age of Aquarius. These two Great Ones work together in daily contact, complete harmony and shared purpose in the evolution of mankind. The Buddha (Master) is the brother of Maitreya. They were among the first group of our humanity to take initiation and have been at the forefront of humanity ever since. He overshadowed Mithras, Memnon and Gautama. He now dwells on the highest center of our planet, Shamballa. He acts as the Divine Intermediary between Shamballa and Hierarchy, and is deeply engaged in the process of Maitreya's mission as World Teacher. He will send two initiate disciples to reform Buddhism. Maitreya and the Buddha were among the first group of earth humanity to 'achieve', that is, take initiation, way back in early Atlantean times. They have been at the forefront of humanity ever since. The Buddha is deeply engaged in the process of Maitreya's mission as World Teacher. Buddha, Gautama (c563-483) Avatar, was overshadowed by The Buddha. Sri Krishna (5.0) (c3000 BC) Avatar. Maitreya overshadowed Sri Krishna. Despite the discolouration that has occurred by its dissemination over the centuries, the Bhagavad Gita remains a fairly accurate allegorical statement of his teaching for that time. Krishnamurti (4.0) (1895-1986) was one of a small group that were prepared as a possible vehicle for Maitreya to manifest through. Maitreya then decided that he would come in person so no longer required a disciple to overshadow. Krishnamurti established himself as a great teacher in his own right, with a tremendous following throughout the world. In Share International magazine Maitreya's associate has said: "he was a true disciple of Maitreya. The teachings of Krishnamurti are the teachings of Maitreya." Krishnamurti is due to reincarnate before the end of the 20th century.